In a press release PLAYISM has announced that Kero Blaster, the latest game by Cave Story creator, Studio Pixel, is now available for pre-order on Nintendo Switch in North America, although European users will have to wait until August 16th. Kero Blaster is a side-scrolling shooter with pixel graphics previously released on iOS, PC and PS4. It’s very challenge right out the gate but allows you to save any money collected after dying so you can buy upgrades and come back a bit more powerful than before. Th game also features multiple difficulty settings, and unlockable “Zangyou mode” as well as a boss rush. The latest work from Cave Story’s Creator, Pixel, releases Kero Blaster to the Nintendo Switch. Kero Blaster is a side scrolling action shooting game from Studio Pixel, the creators behind Cave Story. It is now coming soon for the Nintendo Switch. 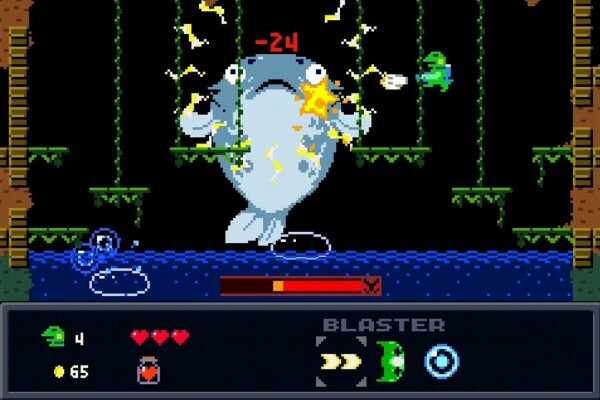 After its success on PC and iOS, Kero Blaster was released on Steam, adding an extra mode “Zangyou mode”, named after the Japanese word for “overwork”. After that, gun-wielding frog saw a release on the PlayStation 4. Now, Kero Blaster is hopping onto the Nintendo Switch. Kero Blaster is currently available on the NA Nintendo eStore for Pre-Purchase, and will be available on the EU Nintendo eStore from August 16th for Pre-Purchase. You play a bipedal frog employed by the mysterious start-up company “Cat & Frog Inc.”. Fend off enemies seeking to stop you and overcome the challenging landscape as you head toward your destination. When you start the game, you’ll likely be surprised by your skimpy amount of life and your crappy weapon. And when the frog runs out of life, he “enters the hospital” and has to restart from the beginning of the stage. But you can keep collecting and saving up money to go “shopping” to increase your life and carefully select powered-up weapons to take down enemies you couldn’t defeat before. The further you get, the stronger you can feel yourself becoming – and it feels good. The characters appearing in between stages are the game’s other charm point. You’ll meet your coworker, who is a cat (for some reason), your president (also a cat), and an office lady of indeterminate species. They work like us, slog through overtime like us, complain, get chewed out, and even comfort each other, just like us. Experience the unique and intricately detailed world of Kero Blaster! A challenging game play with different difficulty settings. Fantastic bosses at the end of every stage.